This article was previous titled “Types of Sony Ericsson phones” – but the company has now renamed to just be Sony Mobile. 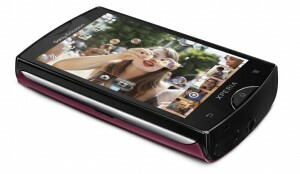 The Sony Xperia S, launched in Q1 2012, was the first phone released under Sony’s new “Sony Mobile” brand – without the “Ericsson” – and also the first phone in the Xperia NXT range. The phone is power by the Android operating system. 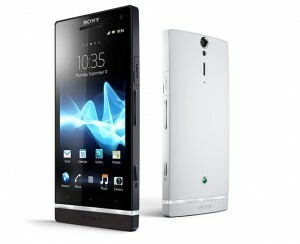 The Xperia S features a very high quality 4.3 inch screen, a 1.5 GHz processor, 12 mega-pixel camera, 1GB of RAM and 32GB of inbuilt storage. From testing the screen is very bright and vivid. The clarity rivals Apple’s retina display. The resolution of the screen is 720×1280, which works out as 342 ppi. This is indeed sharper than the 326 ppi of the iPhone 5. The device also features an HDMI output. The phone has been praised by critics for it’s excellent screen, design and camera – but has been criticised for the lack of removal storage. 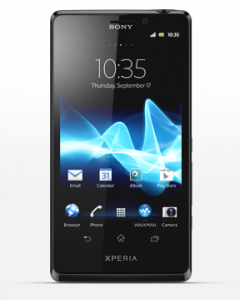 The Xperia T is the successor the Xperia S – a packs a powerful punch with it’s 1.5 GHz Qualcomm Krait dual-core processor. According to tests from PCAdvisor.co.uk the Xperia T is just behind the iPhone 5 and Samsung Galaxy S3 in terms of computing power – scoring an impressive 1528 points in Geekbench 2. The phone has an acceptable but average 16GB internal storage, but does is upgradable via a microSDHC slot. The screen is a good sized 4.55 inches, with an impressive 323ppi that puts it just 3ppi below Apple’s Retina Display. 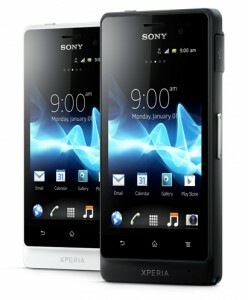 The Xperia T is powered by Android Ice Cream Sandwich – with an upgrade to Jelly Bean in January 2012 due. The Xperia T ways a relatively light 139g and also features an impressive 13 megapixel camera. The Sony Xperia J is a budget priced Android smartphone – selling for around £190. The phone features a 4 inch touchscreen, 5 megapixel camera, 1 GHz Qualcomm processor and weighs in at a light 124g. If you are looking for a budget priced smartphone with a nice screen and design this may be suitable. However don’t expect too powerful a phone – the lower spec processor and internal memory (just 4GB) are drawbacks, though the memory is expandable. 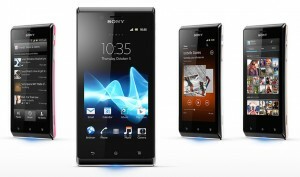 The Sony Xperia U weighs in at just 110g, is both slim and smaller than many other phones. The screen is a relatively small 3.5 inches. The phone is powered by Android 4 Ice Cream Sandwich. The device comes with a 5 mega-pixel camera. With an RRP of just £149.00 the phone may suit some budget users demands and the phone does have a striking design. The phone features changeable bottom caps – allowing you to customise the phone with a range of striking colours. 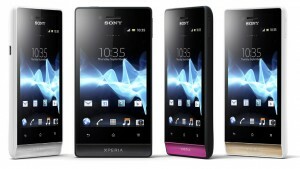 The Xperia miro has four different stylish colour variations. The phone is a light 110g and has a small 3.5 inch screen. The RRP is just £159.00 making a lower-end phone – which is reflected in the stats, the phone comes with just 4GB of memory and an 800Mhz processor. Reviews have been good with some three star reviews. Critics have praised the good build quality and battery life, though have criticised small, low resolution screen and slow processor. 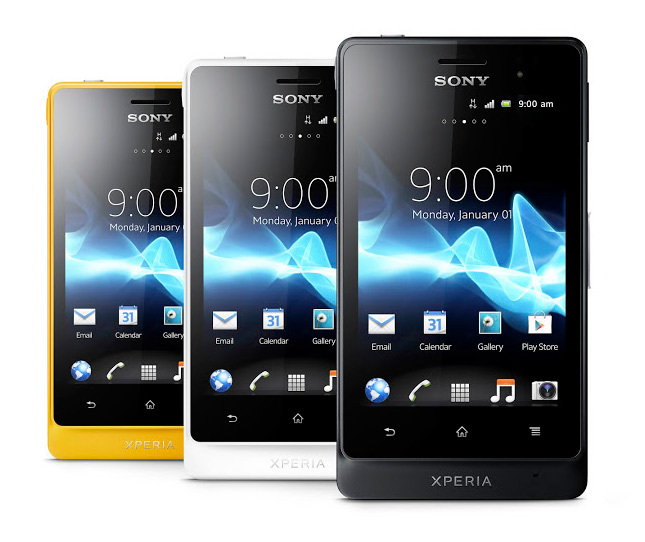 The Sony Xperia go is designed to be a tough, hardy phone, designed to be able to withstand the elements. It comes in at a well priced £189.00 RRP. The phone weights just 110g. The device is powered by Android 4 Ice Cream Sandwich. The phone is designed to be dust & waterproof, and the 3.5 inch screen is made of tough scratch resistant material. There is a 5 mega-pixel camera onboard, as as an FM radio. The phone comes with 8GB of memory expandable via a microSD slot up to 32GB. 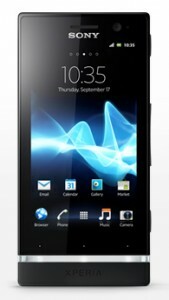 The Xperia tipo has a particularly low RRP of just £119.00. The Android powered phone is small and light at just 99.4g. The display is 3.2 inches, made of scratch resistant TFT. The camera is a modest 3.2 mega-pixels, so if you are looking for a good camera you will want to look elsewhere. The phone has a very small 2.9GB of memory, though this is expandable via a microSD slow up to 32GB. The processor is a low end 800 MHz Qualcomm Snapdragon. 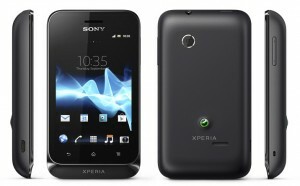 If you are looking for a budget phone this could work – but do not expect the power of other Xperia phones such as the Xperia S.
The Xperia mini is both light and small – weighing in at just 99g. The phone features a 3 inch scratch-resistant TFT touchscreen. There is a 5 mega-pixel camera capable of HD video recording at 720p. The phone has a very small 1GB of internal storage, though this is expandable via a MicroSD slot. The phone comes with Android 2.3 Gingerbread.